Happy End of the Old Year, Friends! Here’s to always making it better and better for all living things, together. Wishing you all a happy, healthy, and joyful 2018. Yes, life is a challenge, but where there’s life, there’s hope. Remember, pets do not like fireworks. Keep your pets inside, and safe, on New Year’s Eve. And ENJOY! I’ve spared you my usual endless details of exactly what we did for each rescue organization listed below. You know by now. If they are listed here they are wonderful, do great work, and received everything from donations to Little Guy Grants from us this last period. Please check them out and support them if they are near your city. A great cat rescue whose pictures do not transfer from their site. So go there to see the cats, and get one! “We rescue dogs and cats, and do not discriminate against age/breed. On Oct. 22, Wiley drew a magnificent Sunday strip that ran in newspapers across the country, moving the whole darn country to tears. He sent people to www.tailsofjoy.net in that strip, and we made many new friends. Then, he donated the original strip to us for auction on ebay, to benefit Tails of Joy. With 78 bids, the strip sold for $2600. But people kept emailing to ask how they could get a copy, everyone still wanted to own this beautiful piece of art. So Wiley decided to print color versions, one at a time, hand signed by him individually any way you request, for $150 each, to continue to benefit Tails of Joy. Hero. Wiley and Victoria, beautiful inside and out. “Where life begins again.” For abused and neglected horses, ponies and donks. I have collected Shari Elf’s art since we met in the 1990s. She is not only an incredible artist, designer, musician, seamstress, and all around special soul, she is an angel. I had so much of her art with nowhere to display it, even though it was painful, I decided to auction it off to benefit TOJ. Shari, knowing if she auctioned it to her collector fans she’d get the most for us, did all the heavy lifting of photographing, listing, writing, wrapping, shipping, etc. etc., and didn’t take one penny of the proceeds, which were enough to save nineteen dogs this holiday season. Shari, we love you and thank you, and want to buy more art from you even though we have an open floor plan with no walls. Their photos do not come off their website so please go look at the pugs, and then bring home four or five. They’re small. “We bring dogs (and an occasional cat) into our rescue primarily from municipal CT pounds. We also help dogs whose families are unable to continue to care for them for a variety of reasons. Our mission as a rescue includes helping dogs that might otherwise find it hard to be adopted, or that other rescues might pass by. Whenever possible, we will consider rescuing dogs with substantial medical needs, and dogs requiring training/retraining and behavioral rehabilitation required for each dog to become a wonderful member of an adoptive family. Always walking the walk, year after year, through natural disasters and the usual disasters, Linda Blair keeps hundreds of dogs a year safe, warm, fed, and however long it takes, finds them their forever, loving homes. We helped homeless people and their pets all year long, through our tireless rescue partner, Maria Modica, who runs Tail Waggers Rescue. From vet bills to warm coats for people and their pets, to bags of food, to everything needed, we were there. One person CAN make a difference, and Louann has been proving that for years. She rides to the rescue in Texas when there is no one else, and often calls California and tortures funds out of us. We love her. Ralph and Patty, abandoned in an empty home. Neighbors called twenty rescue organizations in Texas, none could help. We did. Thank you all so much for your support. Our monthly donors make the wheels go round, our any time donors make it possible to save more lives, and our online shoppers make it possible for us to save lives every day. We can never thank you all enough. Thank you a million times. Shop here for so many fun and exciting things. 100% goes to rescue, we are all volunteer, no salaries, no “perks”. We received a beautiful thank you, telling us how much good our last Little Guy Grant did, so we did it again. “Good Evening Elayne!! I wanted to thank you so much for your past support for Paws and Love, Inc. You generously sent us a grant for $5,000 to assist our rescue with our TNR program. (2 checks for $2,500 each). As we begin out budget for the 2018 TNR fund I am hoping we can count on your support again. Your generosity provided TNR services for 100 cats !!! In our community we aim to complete 365 spay/neuters for the 2018 year. That is ONE per day!! I also volunteer my services as a vet tech for these surgeries. No doubt this will require additional fundraising on our part. We would be ever so grateful for any amount you and Tail of Joy can contribute. If you are EVER on the East Coast we would love to have you visit us. Paws and Love is a 501c3 nonprofit organization that provides free-roaming and colony felines with low cost spay/neuter services and vaccinations. This prevents cat overpopulation and that prevents thousands of cats being born, sparing them from short lives of misery and hardship. December 31, 2017 – “Last chance to save a life! Double your gift with a matching grant up to $1,000 today only!” We did. Tails of Joy helps the smallest, neediest cases that fall through the cracks and have nowhere else to turn. A little Boxer girl with a prolapsed uterus needed surgery. Her loving family could not afford it. We believe keeping a pet in a home is as good as putting a pet in a home. We helped. A little puppy with Parvo needed some extra help too. We were there. Millie, hit by a car, dragged herself to the curb. A broken leg was just the beginning. She needed immediate help. We were there. “Hi, I just received a phone call regarding dogs left outside at above residence since the owner moved out a week ago. I visited them this morning and they are cold but I feel would benefit from dog houses until alternative plans made. I need funds today for (3) dog houses at PetSmart. The dogs have no shelter at all. I need to purchase Igloo dog houses for them asap as I cannot get them into the vet office today. I have blankets needed and can get hay from a farmer on the way to them. The temp is 25 degrees and snowing. I have no one to foster as all fosters are full. The dog hotels/boarding facilities I use are full as well. I will get them to some shelter asap but must improvise at this time. And Tails of Joy and our great rescue partner saved three more lives today. Happy New Year! Puppy Mills are the scourge of our country for dogs. Simply, they are factory farming of dogs, with the same inhumane conditions, bringing heartbreak to animals and the people who buy from pet shops, as many are congenitally ill. Wolf Spirit’s rescues puppy mill dogs who are bred out and used up, or “not worth selling”. The reason Tails of Joy donated here is because Wolf Spirit’s does not pay for these dogs. We feel rescues, with good hearts who mean well, but buy these dogs out of the breeding system, are enabling that system. Wolf Spirit’s is a true rescue organization. One of the absolute best rescues anywhere. “Enriching the lives of senior animals.” We love the seniors. Adopting a senior will bring you joy you could never imagine. Try one! We could not do what we do without Leon. He designed the website and troubleshoots 24/7. He and his husband John find the most amazing items for us to sell while they’re shopping to stock their own beautiful furnishings company, Seven Colonial. Leon went to the post office a zillion times this month to get all your purchases out on time. He is a true rescuer and a true hero. And our newest board member. Mostly Boxers, and some Boxer mixes. And Boxers. Did I say Boxers? I LOVE Boxers. We helped put Dusty, a severely abused Malti – Poo, back together again. We donated to help get supplies and transport to needy dogs in Puerto Rico after Hurricane Maria. Twice. The second truck went from North Carolina to Ft. Myers, FL, and then Puerto Rico. It took a village and many dedicated, tireless rescuers. From MDAS in South Florida to waiting homes in Iowa. DOTM Transport #163 is ready to get ON THE MOVE with these wonderful dogs. Every one of these dogs were urgent and almost all had urgent pleas sent out by the shelter for rescue. We have owner surrenders, strays, dogs with URI and other medical issues such as Entropian & severe skin conditions, dogs that were at the shelter for several months and several fearful dogs. All very deserving of a second chance. This transport of very deserving dogs is going to our partner JCHS in Iowa. Not only do we donate money, we often donate items for rescue groups’ auctions/sales/raffles. These donations turn into even more money for the group. Along with our check to Adopt a Boxer Rescue, we donated one of our big beautiful boxer pillows for their silent auction. We sell our gorgeous boxer pillow (along with several other breeds) for $75. We know we’d sell ten times the amount if people could only see them in person. Well, the winning bid for our Boxer Pillow was $212. You have to see these in person. The best way is to buy one. Co-ordination between Southern California and out-of-state rescue groups. Saving hundreds of lives a year by getting dogs out of overcrowded California animal shelters, and transporting them to waiting homes in the Pacific Northwest. And, providing spay/neuter services yearly for hundreds of animals. We brought five cartons of donations to their Sherman Oaks Rescue Resale Store. Please shop there and donate your unwanted items too. To see all of our rescue work in 2017, please go here and enjoy our happy stories in bite size posts. 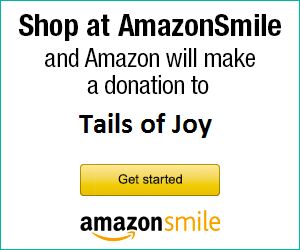 IF YOU SHOP ON AMAZON: PLEASE remember to choose Tails of Joy, Studio City, as your charity at Amazon Smile. Bookmark it and you’ll always be on the right page, and Amazon will donate to us every time you shop, at no cost to you. Thank you. Click here to get started. If you live in So CA please link your Ralph’s Market card to Tails of Joy and they’ll donate to us every time you shop at no cost to you. Click here to sign up. It must be done anew every single year, and will be good until September 1, 2018. Thank you to all who shopped us for the holidays. Here is our friend Janet’s gorgeous tree, sporting all of the Tails of Joy critters you made such a success. Our totes flew off the shelves and saved so many lives. Thank you. There are about two dozen left, and when they’re gone, they’re gone. We thank you all and love you. We will keep our paws crossed for a better world for all in 2018, and we will always, always try to be there for you and your pets. Bonnie and Bravo, rescued Rottweilers of our wonderful friends and supporters, David and Natalie Sackin Schlocker of DRS and Associates.